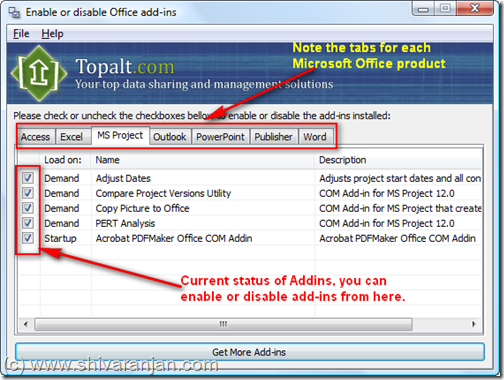 Topalt Enable-Disable Office Add-ins is a free tool using which you can enable, disable and manage add-ins for all Microsoft office products like Access, Outlook, Word, Excel, PowerPoint, Project and etc. Add-ins enhance the functionality of the Microsoft products if we take the example of Outlook which has got numerous add-ins available and sometimes it is essential to disable few add-ins that may be causing issues. What Microsoft Office lacks is a centralized place to manage add-ins but Topalt Enable-Disable Office Add-ins does exactly that, once you install the software it lists all the add-ins that are listed for a Microsoft Office product in tabs. To enable or disable a add-in for a product just select the product and then uncheck to disable the add-in and check to enable it. As most you use Microsoft Office products this tool is a must have. Microsoft Outlook 2000, 2002 (XP), 2003 or 2007 installed. Microsoft Windows 98, ME, NT, 2000, 2003, XP or Vista installed.